Making it as an artist is a dream for many. It’s a profession that affords you the ability to make a living being creative, but more importantly doing something you love. 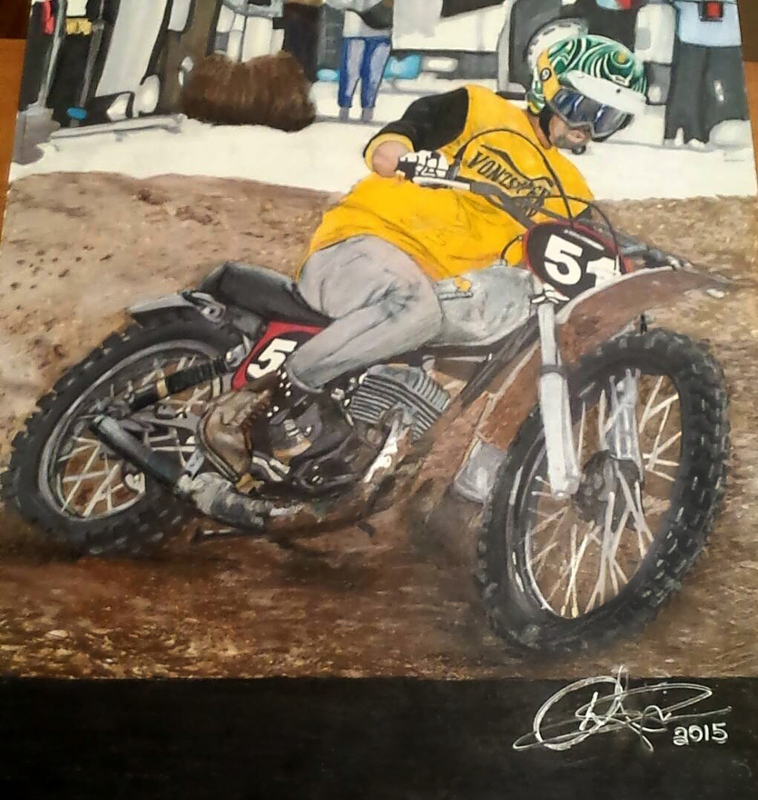 For Derek Gibson, art has always been a passion of his, and through perseverance and hard work, he was able to combine painting with his other love of motocross. 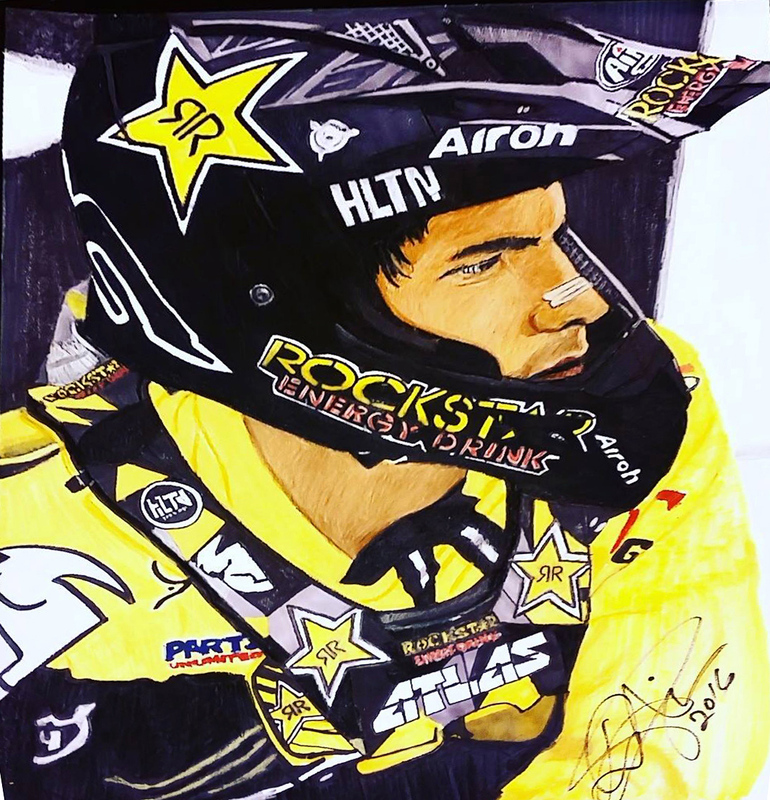 Over the years, Derek’s skills with a brush and pen have allowed him the opportunity to paint during Supercross events, make some money, and donate his work for charity. 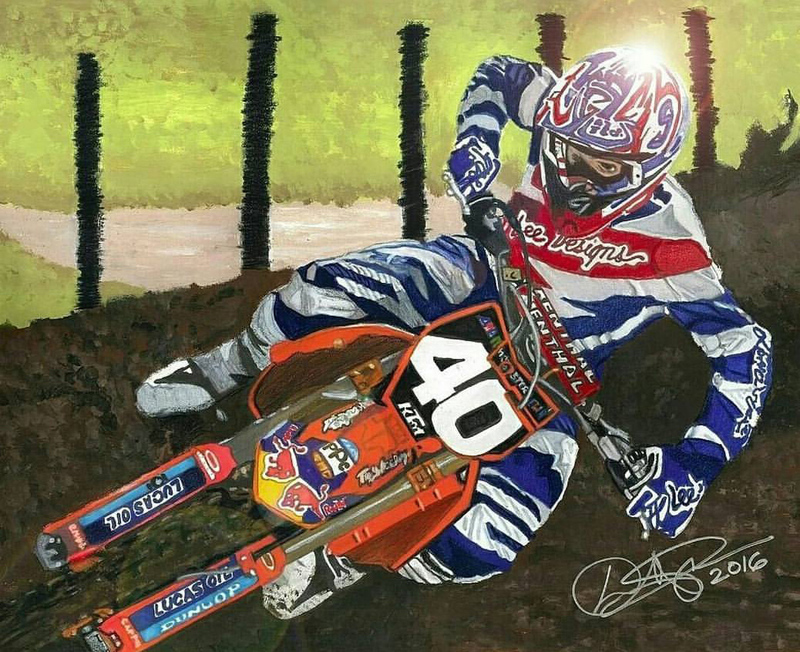 With his art popping up all over the place, we decided to check in with him to get a little background on how he got into painting, motocross, and what led to him combining the two. I’ve always liked to draw ever since I was a little kid. Right before racing the Millville Pro National, I had a serious head injury from a practice crash that pretty much put an end to my racing. So one day, I started drawing seriously to see what I could do with my artistic ability. 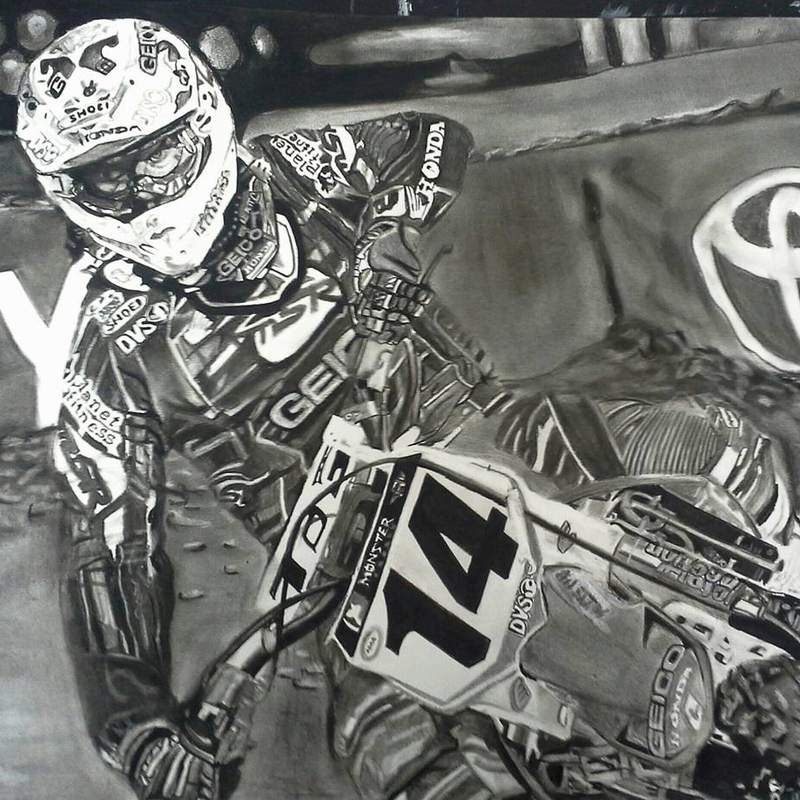 Ever since that day, I’ve put everything into my artwork so I wouldn’t have any more regrets like I have with racing. Someday I want to be able to look at where I’m at, good or bad, with my artwork and know I gave it everything I have. I enjoy putting a smile on someone’s face when they see the end result of the artwork. I get inspiration from the work of other artists. I always compare my work to theirs and want my stuff to be at their level someday. The discipline it has taught me; it has taught me to stay focused. Seeing the rewards of the finished product, and hearing that others enjoy it, is very rewarding. 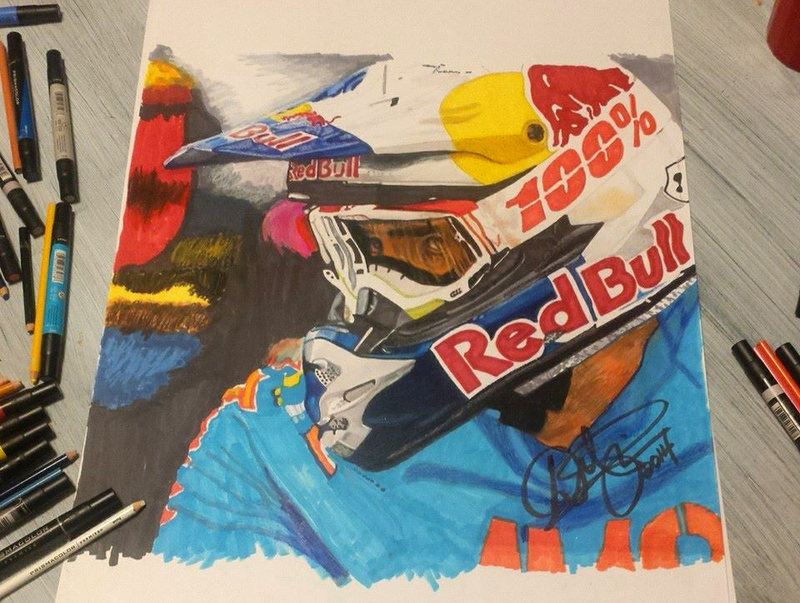 It’s also pretty rad when I get text messages and phone calls from some of the top pros in the sport of motocross wanting to have artwork done. What is your proudest accomplishment when it comes to painting? 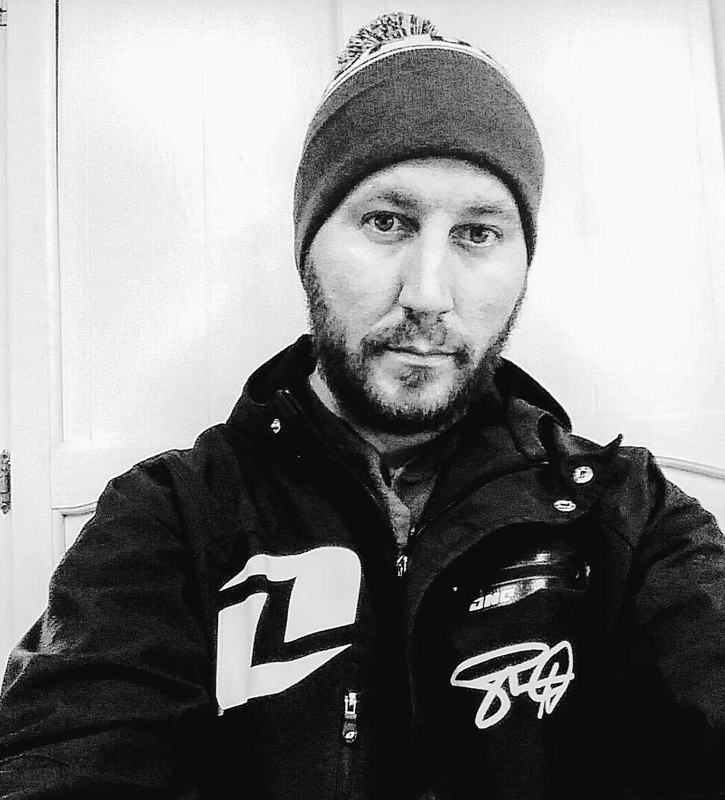 Getting to do interviews with companies like yours, and also being featured in the Five Minute Interview with Derek Gibson in Racer X Magazine. 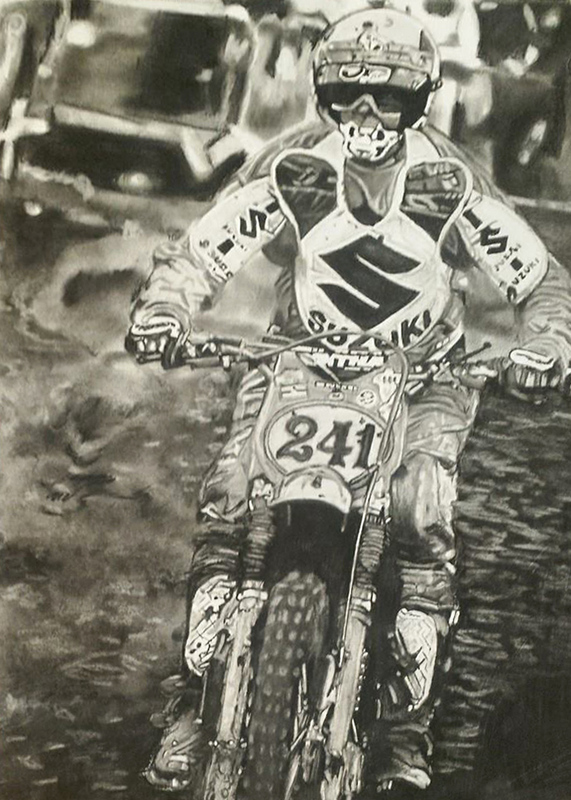 This Supercross season I also got to do artwork, of Jason Anderson, in the pits at the St. Louis round while sitting at the Rockstar Husqvarna semi. 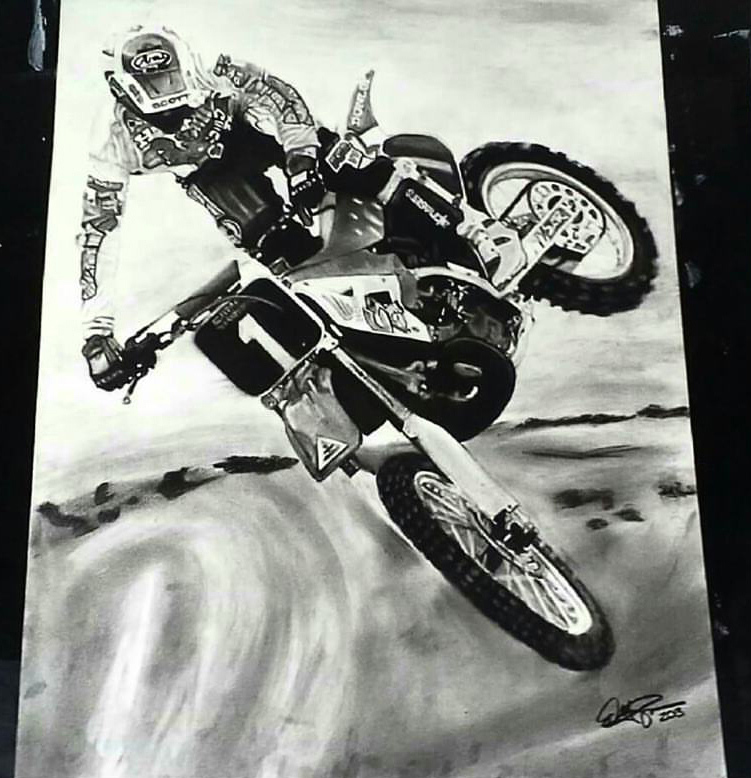 Another cool thing from my artwork is seeing my hard work pay off in the world of motocross/Supercross, and being able to donate my work and raise money for great causes and events. 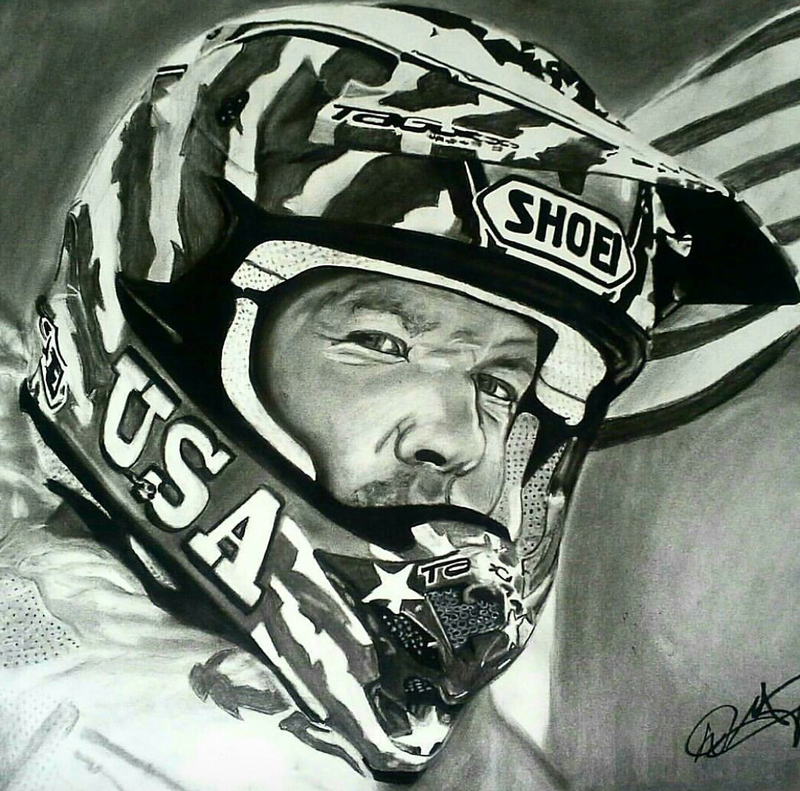 I also really enjoy getting to do artwork each year for the Legends and Heros Tour Hall of Fame Rider they have for opening ceremonies at Supercross. 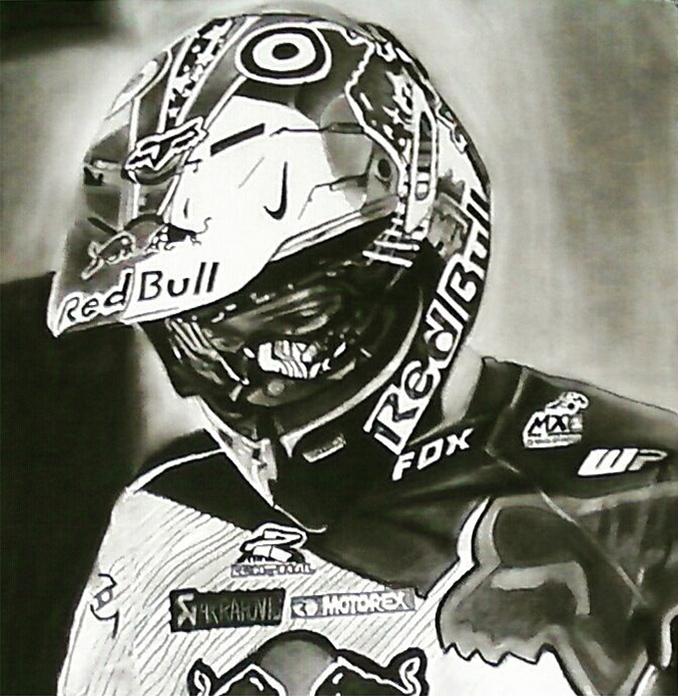 To be the best artist I can and to build a name for myself in the sport of motocross and action sports. I also want to grow as an artist, and hopefully be able to do my artwork full-time someday.